Introduction: Onion (Allium cepa L.) and garlic (Allium sativum L.) extracts are traditionally used in many cultures as antimicrobial agents. Nonetheless, there is still a dearth of scientific validation pertaining to the antibacterial and possible antibiotic potentiating activity of these plants. Methods: Decoction as traditionally used and methanol, ethanol, ethyl acetate, and acetone extracts of onion and garlic were evaluated for their antibacterial activity against 15 bacterial strains (6 ATCC strains and 9 clinical isolates) using the broth microdilution method to establish the minimum inhibitory concentration. The bacteriostatic and bactericidal actions were determined as compared to conventional antibiotics (streptomycin and chloramphenicol). Fractional Inhibitory Concentration (FIC) was determined to establish any synergistic interaction between the extracts and antibiotics using a modified checkerboard assay. Results: The ethyl acetate extract of garlic showed bactericidal effect against 1 ATCC (E. coli) and 2 clinical isolates. Streptomycin produced only indifferent effect (FIC 1< and ≤ 4) when combined with ethyl acetate extract of onion. Chloramphenicol showed synergism with ethyl acetate extract of onion against ATCC S. aureus (FIC 0.27-0.30) and Micrococci species (FIC 0.27-0.32). Streptomycin showed mostly antagonism whereas chloramphenicol showed synergism effects with the ethyl acetate extract of garlic. The observed antibacterial activity might be justified due to the presence of high concentration of phenolic compounds in the extracts. 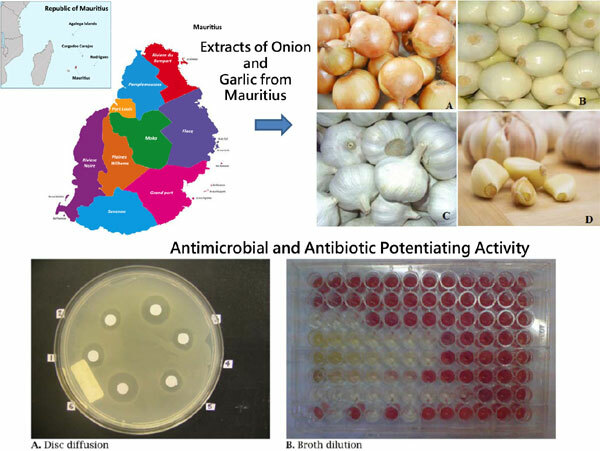 Conclusion: This study has provided an opportunity to establish valuable baseline information on the antibiotic potentiating activity of onion and garlic which can be further exploited for the treatment and/or management of infectious diseases. Keywords: Allium cepa, Allium sativum, Antibacterial, Bacteriostatic, Bactericidal, Phenols, Flavonoids, Phytochemicals, Mauritius. Keywords:Allium cepa, Allium sativum, Antibacterial, Bacteriostatic, Bactericidal, Phenols, Flavonoids, Phytochemicals, Mauritius. Abstract:Introduction: Onion (Allium cepa L.) and garlic (Allium sativum L.) extracts are traditionally used in many cultures as antimicrobial agents. Nonetheless, there is still a dearth of scientific validation pertaining to the antibacterial and possible antibiotic potentiating activity of these plants.